Starting in the fall, students will not have to spend a fixed amount of money at on-campus venues like J Street. The switch to an open dining plan comes as Sodexo's contract is set to expire. Updated: March 28, 2016 at 9:23 a.m.
Student leaders said last week’s changes to the dining program will solve a years-old problem. A new open dining system, to start next fall, will lift spending mandates for on-campus dining options – such as J Street and Pelham Commons – and allow students to use Dining Dollars at any location that accepts GWorld. Student leaders said that change makes GW unique among its peers and can save students money. GW’s new dining system makes it an outlier among its group of peer schools. All 14 of GW’s peer schools at least require students to pay for some of their meal plans at on-campus dining halls. While GW will still offer on-campus dining options, they will be scaled back significantly. 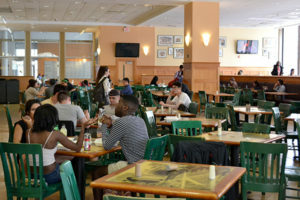 University spokesman Kurtis Hiatt said J Street will close this summer to become “a more modest dining option.” Officials will also renovate the basement dining area in Shenkman Hall. The change comes as GW’s 10-year contract with Sodexo expires later this spring. A group of students and officials spent the fall semester reviewing proposals for new dining providers. These will be the first major changes to J Street since 2011 and 2012, when fast food restaurants were swapped out for healthier, Sodexo-owned vendors. Those changes led to a 25 percent drop in sales a year later after GW stopped mandating sophomores eat in on-campus venues. In the current system, freshmen must spend $700 in J Street each semester. Hiatt said the University would market its new dining plan to prospective and incoming students during admitted students days in April and at Colonial Inauguration this summer. Dining has been a major topic of conversation among student leaders in the past years, who cited a high cost of living in D.C. and few affordable options available on campus. 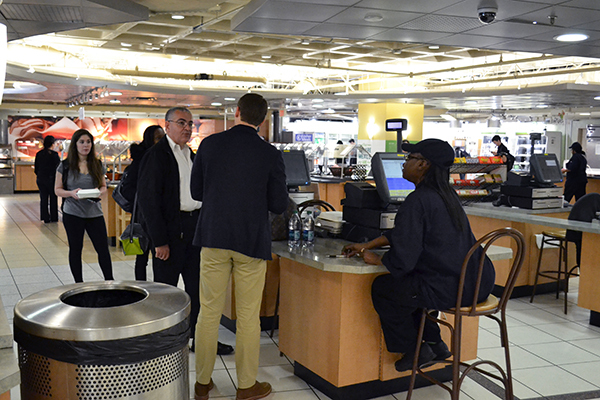 There are two GW-operated dining options on the Foggy Bottom and Mount Vernon campuses each. Student leaders said food price was their main concern in evaluating the proposals. Last year, former Executive Vice President Casey Syron proposed implementing a swipe system at on-campus dining sites so that students would pay every time they entered the dining hall, instead of paying per item or per pound. Restaurant Associates will become the new dining provider for catering and dining halls on the Mount Vernon Campus. Students involved in reviewing the proposals said Restaurant Associates is committed to creating affordable options – something they have called for over the last several years. “How many times have you gone to J Street disappointed with what you’re purchasing and how much you’re paying? I definitely see more than a positive coming from this,” Syron said. Students have complained in the past that the price of food at J Street is more expensive than those of similar options near campus. Syron, who resigned in January, said conversations with students convinced him there was no longer an appetite for a central dining space on Foggy Bottom. “After talking to a couple dozen people, it’s pretty apparent no one is really wild about the dining hall. We’ve all had a sour taste in our mouth with J Street and Sodexo,” he said. He said the new setup will be an “experiment,” but could benefit students by giving them more flexibility. In the past, students have said the options at J Street are limited and overpriced compared to those at other dining spots in the area. Officials distributed a survey last spring to gauge what students wanted in a dining hall, asking questions like how much they spend on and off campus and how their dining habits on weekdays and weekends differ, although the results have not been released. GW’s open dining plan will also bring a “living room” for students, part of SA President Andie Dowd’s plan to make the first floor of the Marvin Center more comfortable and inviting. Dowd has recommended that those changes include replacing the long tables near J Street with couches and more comfortable chairs. District House, which will open this fall, will also house five dining vendors in its basement. Student leaders have in the past called for those vendors to be affordable options as they look to make life on campus more affordable. These two major changes in dining options will significantly alter GW’s dining landscape for the first time since Whole Foods opened on I Street in 2011. At least three new options will be available, the largest slew of new eateries opening on campus at one time in recent history. Students who reviewed the Restaurant Associates’ presentation said they were impressed with the company’s ability to use social media to market to college students. In the announcement, the University said that with Restaurant Associates, it would look into creating an online platform where students could “search for partner restaurants based upon cuisine, location, menu options and pricing.” A University spokesman declined to release any additional details about the plan. Residence Hall Association President Mike Massaroli said he was impressed by the company’s “deep roots” in the D.C. area. Restaurant Associates already manages dining locations at landmark sites in the District including U.S. Senate office buildings, the Capitol Visitor Center, the Kennedy Center, the Newseum and five Smithsonian properties, according to its website. The company also operates dining locations at Princeton and Harvard universities. At Princeton’s Genomics Cafe, run by Restaurant Associates, students can get specialty sandwiches for $6.25 and salads for $6.45. At Harvard Business School, the company operates a food court, grille, bistro and sushi bar. Massaroli said the company’s connections to high-profile sites and prestigious universities would be a boon to GW. The staffers at J Street are employed by Sodexo and contracted through the University. Those employees will be contracted through Restaurant Associates, but with scale-backs at GW’s on-campus locations, the number of staff members could be reduced by as many as 10, according to a release. Sodexo officials said in the initial announcement that they will work to place Sodexo employees laid off from GW to work at nearby locations. The Department of Labor is investigating Restaurant Associates for allegedly incorrectly classifying workers at its U.S. Senate locations, putting those workers at a risk of being underpaid, The Washington Post reported this month. The issue of dining employees has received attention from the Progressive Student Union, which started a petition calling for workers to be retained during the transition to Restaurant Associates. The petition has amassed more than 1,900 signatures. PSU members delivered the petition to administrators during a rally Friday afternoon.